Cashew chicken can be a healthy option at Chinese restaurants if you practice portion control. If you are eating more than 1 cup, however, the calories, sodium and fat can quickly add up. The ingredients found in cashew chicken vary based on the chef. In addition to cashews and chicken, common ingredients include vegetables, soy sauce, oil and hoisin sauce. 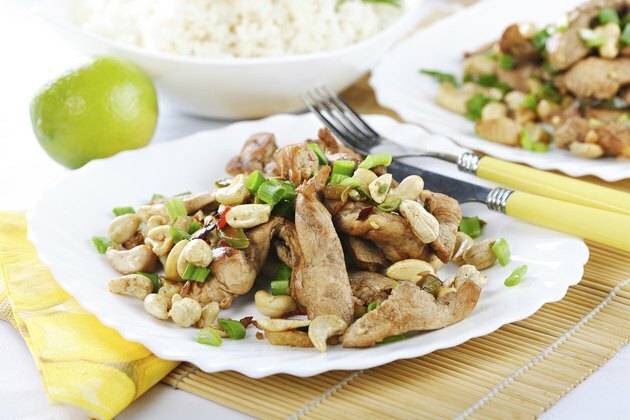 One cup of cashew chicken contains 375 calories. Fifty percent of the calories come from fat, 32 percent from protein and 18 percent from carbohydrates. The high fat content of the dish is due largely to the good fats, or monounsaturated fatty acids, in the cashews. Monounsaturated fats help protect your heart and decease the risk of heart disease. Additionally, 1 cup contains 1,050 milligrams of sodium. Eat a green salad with a vinaigrette-based dressing or steamed vegetables with the cashew chicken to add nutritional value without adding excess calories or sodium. If you're eating rice with the chicken, chose brown rice and limit your portion to a serving size of 1/2 cup. Additionally, you can choose low-sodium soy sauce to decrease the sodium content of the dish. ChooseMyPlate.gov: What Counts as an Ounce Equivalent of Grains?